Product information "ULINKpro Debug and Trace Unit"
ULINKpro, together with MDK-ARM, provides extended on-the-fly debug capabilities for Cortex-M devices. You are able to control the processor, set breakpoints, and read/write memory contents, all while the processor is running at full speed. High-Speed data and instruction trace are streamed directly to your PC enabling you to analyze detailed program behaviour. 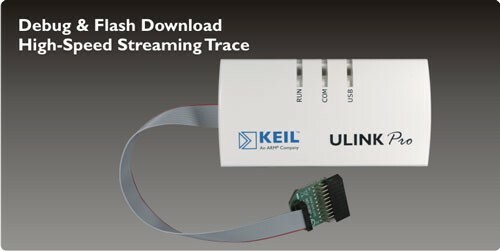 Related links to "ULINKpro Debug and Trace Unit"
Customer evaluation for "ULINKpro Debug and Trace Unit"